“Nothing is wrong with being somber” is one of many conclusions one can draw after seeing the faceless, yet melancholy characters illustrated by Chrissy Brimmage. Brimmage, an Atlanta artist, mainly focuses her multifaceted skills on ink drawing, painting, sculpture and digital art. Brimmage's images have a distinct geometric look, typically featuring genderless characters in states of pensiveness and loneliness that are strikingly relatable. 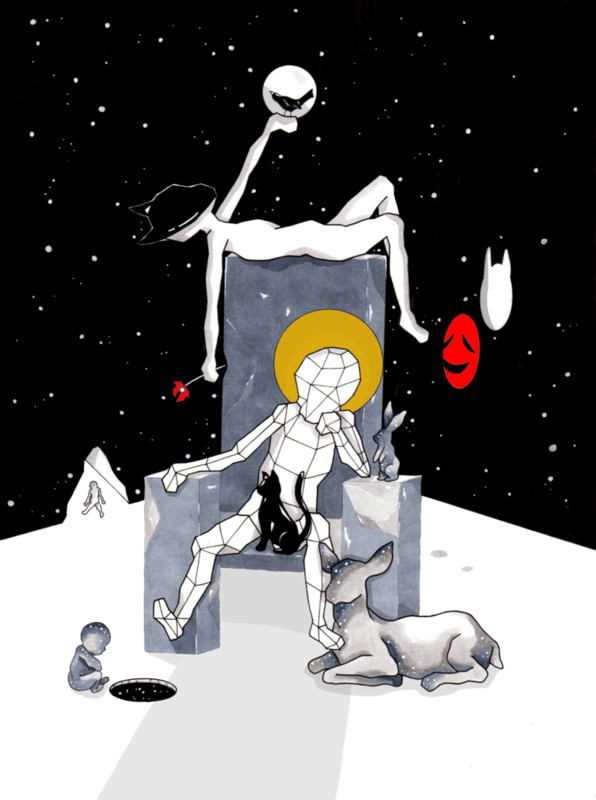 Reoccuring elements in her illustrations include figures, seemingly existing in voids of white, speckled space, and hollows pockets leading to nowhere, sometimes in the bodies of her figures. Brimmage can recall starting her particular and distinct style in 2014, after a study abroad trip to Thailand . "People always ask me if something specific, in Thailand, happened to inspire it. It was nothing directly about the trip in Thailand, but when I tried to make stuff in my old style I just couldn't do it. I thought that was the end of my art career." Says the artist. Prior to her current style, Brimmage’s focus was in painting, with a more colorful and whimsical approach. Now, most of what creates is mostly in black and white, with serious and somber tones. Despite the precise geometric lines, her characters, nameless, display the gracefulness of ballet dancers. Quite simply, her work doesn’t need much color. They are expressive in their own right. Like many artists, her vision for her expressive work started with a dream. Brimmage explains a dream that she had, featuring a world of wireframe renderings, similar to engineer models. That following morning she attempted to recreate the imagery, and impressed herself with the result. She then began to study the engineering process, and begin rendering it in her own polygonic style. In regards to developing her own visual style, Brimmage says this: "I feel like when I first started art, things were a mix of things I like, and other people styles. It was a hodgepodge of other people's [style]. I feel like as I started to get older...it was just natural… I feel more at home with what I do now." says the artist. Brimmage graduated from Georgia State University, not as an art major, but as a business management student. Brimmage admits that her business degree truly helps with her art career. "Whether it's writing emails, writing grant proposals, or writing your artist statement it's so prevalent...I feel like I'm able to do more." Says Brimmage. She says that instead of solely being on the visual side of the industry, she is able utilize skills such as project management and project planning skills. "Most of the stuff I do I'm able to do on my own, so I'm very grateful," says Brimmage. Brimmage says the top skills she's attained from her business degree is business writing, speaking, doing presentations, and profiling an audience. We waxed poetic about the importance of knowing how to communicate your plans and goals with your audience over bubble tea. "A lot of artists underestimate the importance of titling and being able to speak about your work. A lot of times, what pushes people to buy your work is the extra information you give them. The context of your piece is what's really going to connect them to it." says Brimmage. Outside of the rigorous business elements, Brimmage admits that her process is not much of a process "It's really a mess until it's not a mess." She compares it to a mediation process. "If I do have an inkling of an idea, I really just meditate and think about it until I can bring it to a sketch". The characters present within Brimmage's art seem to be heavily based on emotion. Somehow without faces, her characters can still be felt. 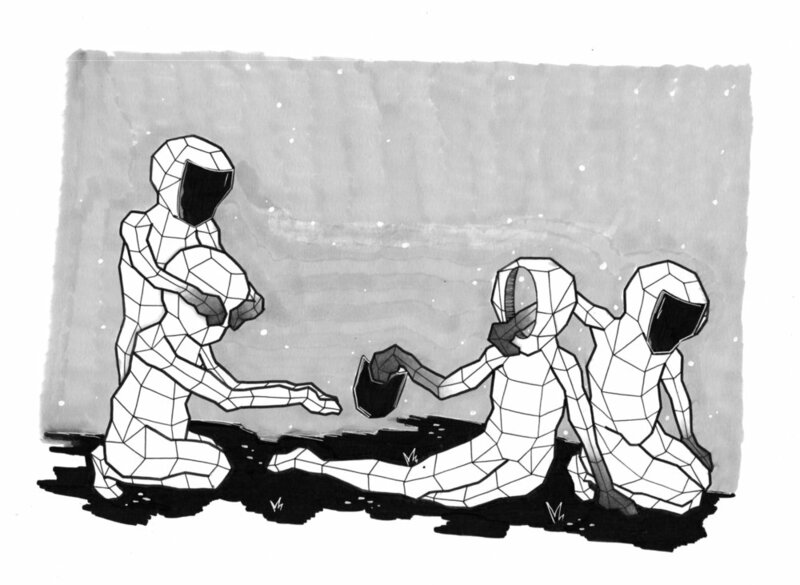 Many of them are closed in and posture, even if interacting with other characters, positioned in open spaces. The droop of their bodies and their posture conveys most of what is depicted. Her characters are brought to life by Brimmage’s fascination with movement. Fitting, considering one of the first subjects that she started drawing were dancers. She became fascinated with the way that their movements can be conveyed into metaphors and messages such as freedom. The floatiness and closed off nature of the images is often based on how Brimmage herself feels. "It's really important for me to be honest and transparent in my work," says Brimmage "that's something I'm always trying to do and trying to foster...A lot of people say that my work is sad and somber. I don't think I really agree that my work is sad, but I do think it is somber sometimes." she says. Brimmage takes pride in the honesty of her pieces. She aims for being transparent and honest and her pieces in a way that others can identify with. "Not even for the sake of saying that I have honest art, but for healing purposes." She says how the reactions even if it is crying to her artwork is helpful to her and showing that she is doing the right thing and causing a connection--a vital aspect of art. In the future, Brimmage can see her fascination with movement come to life, have a dynamic life of its own, and express its own sense of autonomy, by finding ways to merge her art with technology and the human experience. “ I feel like technology has gone super hand-in-hand in art since the beginning. Even something as simple as a paint tube allowed painters to go outside to make landscape art. Now, technology looks a lot different. It’s scarier for some people, but for me it gives the opportunity to create new experiences and ways to experience art.” In the end, giving people a personal, interactive connection to artwork is what Chrissy Brimmage strives toward.